Nazeefa is an undergraduate researcher at the Evolutionary Genetics Research group, University of Huddersfield, studying the evolutionary genomics of eukaryotic transposable elements. 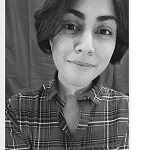 Besides research, Nazeefa is interested in a web-development, programming, promoting bioinformatics as a science of the future and making it inclusive for everyone. Nazeefa serves on the web committee, and the outreach committee of the ISCB Student Council and the RSG-UK.